You may see a great sunset or milky way photo and think.. "WOW" whoever took that was really lucky being there at just the right time. But the truth is that a lot of professionals do our best to try to plan the best times and places to be when the conditions will give us the best chance to get the shot we want. To do this I use a series of apps that I have found to be invaluable when planning my trips. 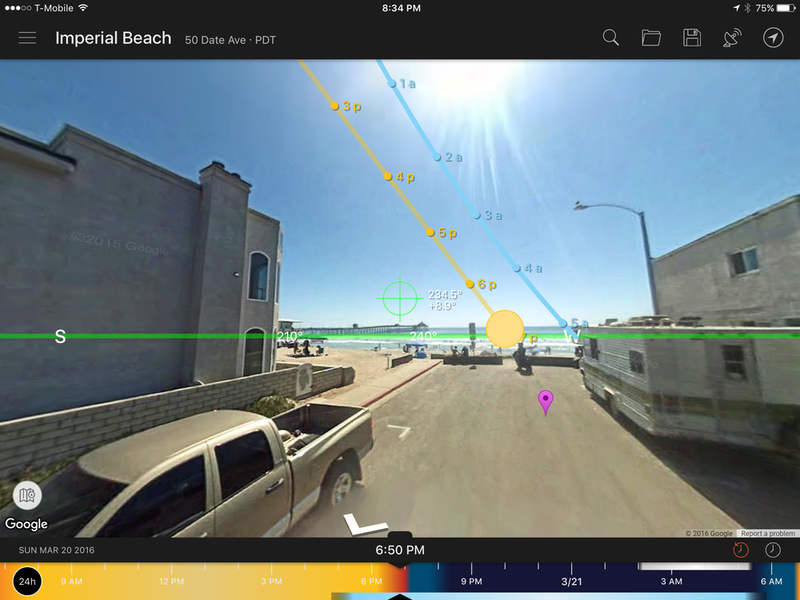 I want to share these apps and why I use them with you so that you to can learn to plan ahead and give yourself the best shot at "the shot"
Sun Surveyor: There is not enough i can say about this app and its value as a planning tool. It can tell you everything you need to know about when and where the sun, moon, or milky way is going to be. Its interface is very intuitive and easy to learn and makes pre-visulization and pre-composition a breeze. It has a few different options to view the information you want. live View: Uses your phone or tablets camera to superimpose the sun, moon, or milky way track right over the image. Ephemeris: gives you all the numbers in text form if you prefer them that way. Street View: uses Googles street view to let you view locations they have mapped with the overlays without even having to be there. The main screen Shows you all the locations around you that you can choose from.. Here I have selected Scripps Pier in La Jolla, California. When you select a location and hit the little I the information panel pops up and shows you that days high and low tides. You can also use the arrows to go to a certain date or tap the options at the bottom of the panel to see more information like the currents and moon phase as well as share the current information to friends of social media.